Almost 6 to 12 million kids are affected by head lice infestation in the United States. It is one of the common problems and has no relation to poor hygiene. Though the head lice infestation can occur at any age, it is seen common in children of age up to 14 years. They stay close to the scalp laying eggs and feed on blood for surviving. They can live up to 24 hours without human contact and stay alive for up to 8 hours in the water. They spread easily from one person to another person through a head to head contact, using contaminated beds or furnishing, using hair accessories and combs of an infected person. Itching, scratching, red bumps and rashes on the scalp are the symptoms of head lice infestation. If one person in a family is infested with head lice then the whole family should take enough measure to get rid of them and prevent them. There are many over the counter solutions to get rid of head lice but they have side effects. If you are looking out for natural solutions that don’t have side effects then this article is for you. Here we have written about an amazing ingredient that helps to get rid of the problem successfully without any discomforts. It is none other than vinegar. Vinegar contains high amounts of acetic acid which kill the head lice successfully. It loosens the grips of nits or lice eggs that are present on the hair shaft. This makes it easy to remove them with a nit comb. How to Use Vinegar for Head Lice? There are various methods of using vinegar for head lice. You can use white vinegar, apple cider vinegar, balsamic vinegar or malt vinegar for treating head lice. Choose any of them as per availability and try it regularly without fail. Dilute vinegar in enough amounts of vinegar. Wash your hair normally with regular shampoo. Rinse your hair with diluted vinegar and leave it on for 10 minutes. Wash your hair again with fresh water. Combine equal amounts of white vinegar and mineral oil. Apply the solution onto the scalp and hair before going to bed. Cover your hair with shower cap and leave it on overnight. Wash your hair with your regular shampoo and comb thoroughly while it is still wet. The acidic property of lemon juice removes the head lice. It also helps in preventing the infestation. Mix freshly squeezed lemon juice and vinegar. Apply it onto the scalp. Now rinse off with fresh water. For extra benefits, you can use egg yolks. The desiccation property of salt eradicated head lice. It also helps to prevent the itching and any scalp infections. Combine 1/4 cup each of salt and vinegar. Spray the solution into the scalp and hair until wet. Cover the head with shower cap or towel. Let it stay for 2 – 3 hours. Follow the process 2 – 3 days in a week. The lubricating nature of coconut oil stops the lice from crawling freely and reproducing. Apart from that, it heals the scalp from any infections caused by scratching. Pat dry the hair completely. Apply coconut oil onto the scalp and along the hair. Cover the hair with a shower cap and leave it overnight. In the next morning, comb the hair thoroughly to remove dead lice. Rinse off your hair with regular shampoo. Alternatively, you can use tea tree oil instead of coconut oil. Head lice don’t like the smell of Listerine which repels its crawling and ability of reproduction. Apply Listerine into the scalp and along the hair. Make sure the scalp and hair are completely wet with Listerine. Cover with shower cap and leave it on for an hour. Remove the shower cap and rinse off your water. Apply enough amounts of apple cider vinegar and massage it very gently. Leave the application for another hour. The application of baby oil makes the scalp smooth which makes it difficult for head lice to crawl freely. The baby oil repels it from feeding on the blood. Combine enough amounts of baby oil and apple cider vinegar. Mix thoroughly and apply it onto the scalp and along the hair. Leave it for an hour and comb with a comb meant to remove lice. Combine equal amounts of vinegar, rubbing alcohol and baby oil. Apply the mixture onto the scalp and along the hair. Tie the hair and cover with a shower cap. Leave it on for an hour and brush thoroughly outside in the sun. Repeat the process regularly for at least 2 weeks to see the results. Olive oil suffocates the lice and deprives it of taking oxygen which makes it easy for us to remove them from the hair by combing. In a bowl, combine equal amounts of vinegar and olive oil. Mix well and apply it into the scalp and along the hair. Cover the hair with a shower cap and let it rest for an hour. Remove and comb thoroughly to remove the head lice. Wash your hair with regular shampoo followed by conditioner. Combine vinegar with your regular shampoo. Apply the mixture onto the scalp and leave it for an hour. Now, comb the hair using a nit comb to remove the head lice. This process will suffocate and kill the head lice. When we comb the hair, the head lice will easily come off the hair. In a bowl, combine 4 tablespoons each of bleach, vinegar, and alcohol. Cover the head with a shower cap and leave it overnight. In the next morning, comb the hair thoroughly to remove head lice. Conditioner makes crawling and breathing difficult for head lice. You can use any conditioner for this process. To a spray bottle, add 1 ounce of vinegar, a big squirt of conditioner and 2 cups of water. Spray the solution onto the scalp and along the hair. Leave it to dry for 20 minutes. Comb the hair using a flea comb. Mayonnaise suffocates the lice which make it easy to wash them out of the hair. As per some scientists, mayonnaise keeps the louse in a dormant state. Tea tree oil is also considered one of the effective treatments for head lice because of its pesticide property. Combine mayonnaise, a splash of vinegar, 10 drops each of tea tree oil and neem oil. Mix the ingredients well and apply it onto the scalp and along the hair. Wrap the hair with towel or shower cap. Leave it for 2 hours and wash thoroughly with shampoo. Comb the hair well and remove the dead head lice. Combine 2 ounces of vinegar, six ounces of Dawn (dishwashing detergent) and 2 tablespoons of tea tree oil. Mix well and pour into a bottle. Use this mixture instead of regular shampoo. Wait for 10 minutes before rinsing off the mixture. 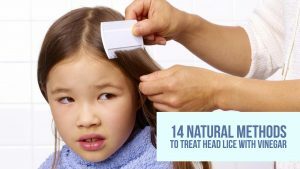 There are various ways of using apple cider vinegar and borax for removing head lice. We have listed them below. Borax is safe to use for topical applications. Warm 1/2 cup of apple cider vinegar. Dissolve 1 tablespoon of borax in the vinegar. To this mixture, add 3 drops each of tea tree oil, lavender oil and eucalyptus oil and 2 caps full of food grade hydrogen peroxide. Use this mixture as regular shampoo and let it sit for 10 minutes. Rinse off your hair with water (add some baking soda into the water for extra benefits). Warm 1/2 cup of apple cider vinegar and dissolve 1 tablespoon of borax in it. Now add 5 – 10 drops each of eucalyptus oil, lavender oil, peppermint oil and tea tree oils. Spray the mist on the hair and brush every morning before going out. For extra benefits, you can add 5 drops of citronella oil and 1/2 cup of colloidal silver). Repeat the application daily before going out. What Kind of Vinegar is used for Treating Lice? For treating lice, any vinegar can be used which include apple cider vinegar, distilled white vinegar, balsamic vinegar, malt vinegar, red vinegar and others. The most important thing to consider while using any vinegar is acetic acid. The acidity level of the vinegar should be 5-7%. Is Vinegar Safe to Use for Treating Head Lice? Vinegar is an old age remedy used for treating head lice. Vinegar is a bi-product of fruits, grains or vegetables. Therefore, it is edible and biodegradable. It doesn’t contain any harmful chemicals that cause discomforts. It is completely safe to use on the family especially people with asthma and kids. Note: If vinegar enters into the eyes, it will sting eyes but does not cause any serious medical damage. Unfortunately, if vinegar gets into the eyes, wash them immediately to avoid stinging. Avoid rubbing your eyes as it can increase the irritation. Warning: Due to severe infestation and scratching, open sores develop on the scalp. If you have open sores on the scalp, avoid using vinegar. It is better to use oil based solution for this problem. Vinegar application will sting a little but if it is unbearable then avoid using it. Use apple cider vinegar that contains mother in it. And vinegar that contains 5 % of acetic acid. It is very important to follow the process regularly to get rid of head lice permanently. Using vinegar once in a while also helps to prevent the infestation. Head lice spread from one person to another so avoid head to head contact and sharing personal belongings of an infected person. Clean your hair accessories and combs regularly. Wash and sub dry bed sheets, clothes, hats, scarves, and towels. Wash this article helpful for you? Do you have any suggestions to share with us? Feel free to write them in the comments section below. On the procedure using vinegar, baby oil, & rubbing alcohol it says to brush hair thoroughly in the sun. It’s the only one that mentions brushing it out in the sun so I thought the sunlight or warmth may have something to do with positive results. Can you explain further? I’d really appreciate any advice! on the head there is plenty of hair to concentrate the mixture but not on the body the mixtures dries in minutes instead of hanging around to kill them?